You can go to other blogs to see the details of the so-called “stimulus” package currently before Congress, so I won’t delve into the specifics [Townhall.com and National Review’s Corner do a fine job–and you can find them on my sidebar]. It’s not a partisan statement to say that this proposed bill is a wish list for all of the dreams the Democrat party has ever had the audacity to dream. True economic stimulus comes from getting the government out of the way of business and allowing people to keep more of their earnings. It does not come from government projects. Obama and the Democrat Congress have turned back the clock (I’ve always wanted to say that, since it is always used against conservatives) to the days of the New Deal. FDR’s “solution” for the Great Depression was to spend government [translate “our”] money. The old Keynesian formula is to spend one’s way into prosperity. If that sounds counterintuitive, it’s because it is. It didn’t work for FDR, and it won’t work now. 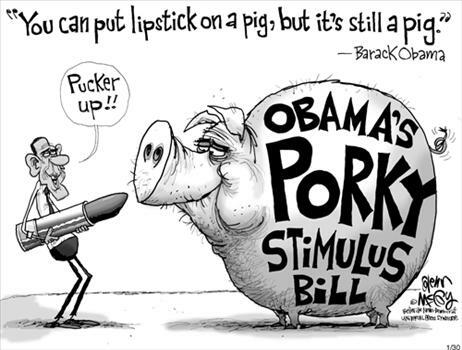 The currenty bill is so laden with porky projects that it has earned the title of the largest earmark in American history. Who will pay for all this? In the end, the taxpayers will, one way or the other. His campaign rhetoric is making an unwelcome reappearance.